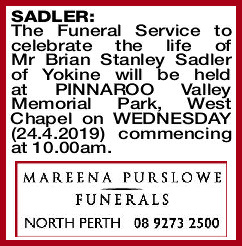 The Funeral Service to celebrate the life of Mr Brian Stanley Sadler of Yokine will be held at PINNAROO Valley Memorial Park, West Chapel on WEDNESDAY (24.4.2019) commencing at 10.00am. 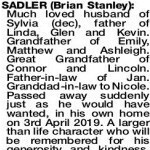 Much loved husband of Sylvia (dec), father of Linda, Glen and Kevin. Grandfather of Emily, Matthew and Ashleigh. Great Grandfather of Connor and Lincoln. Father-in-law of Jan. Granddad-in-law to Nicole. Passed away suddenly just as he would have wanted, in his own home on 3rd April 2019. A larger than life character who will be remembered for his generosity and kindness. He will be dearly remembered and sadly missed. We would like to thank everyone for their love and support during this difficult time. A legend in his own life time and a great lateral thinker. Sadly missed by Gordon and Barbara, Donna, Megan and family. Goodbye big Bruv. Dearly loved brother of Joan and Jim (dec). 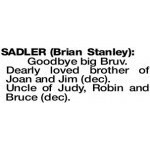 Uncle of Judy, Robin and Bruce (dec). 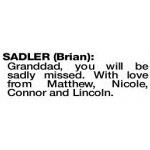 SADLER BRIAN Granddad, you will be sadly missed. With love from Matthew, Nicole, Connor and Lincoln. 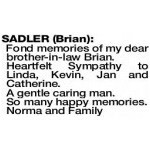 SADLER BRIAN Fond memories of my dear brother-in-law Brian. 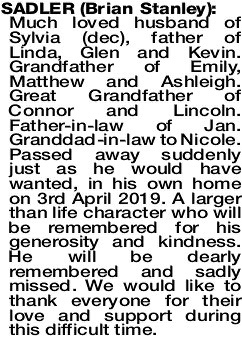 Heartfelt Sympathy to Linda, Kevin, Jan and Catherine. 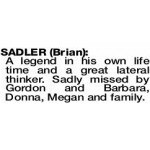 Deepest sympathy to the Sadler family at this sad time. Brian, you were always willing to help no matter what time of the day. Many fond memories of late nights working to get the job done. 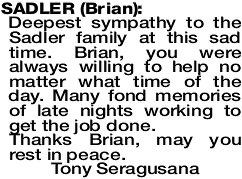 Thanks Brian, may you rest in peace. 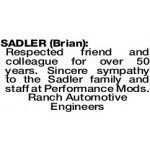 Our deepest condolences to the Sadler family and the staff at Performance Mods on the passing of Brian. 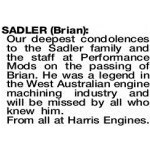 He was a legend in the West Australian engine machining industry and will be missed by all who knew him. From all at Harris Engines. 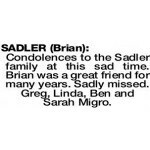 SADLER BRIAN Condolences to Linda Kevin and Sadler Families. Much appreciated Boss and friend to all of us. The memories and stories will live with us forever. The way you inspired and educated us with your Sadlerisms. Thank you for letting us be a part of your life. Gone but never forgotten. Respected friend and colleague for over 50 years. 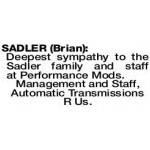 Sincere sympathy to the Sadler family and staff at Performance Mods. 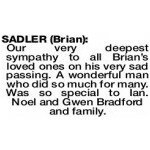 Our very deepest sympathy to all Brian's loved ones on his very sad passing. A wonderful man who did so much for many. Was so special to Ian. Noel and Gwen Bradford and family. Farewell Brian. Best Friend and Technical Advisor to me for 70 years and important mentor to my Son Rob. 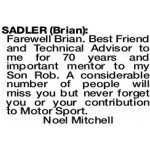 A considerable number of people will miss you but never forget you or your contribution to Motor Sport. 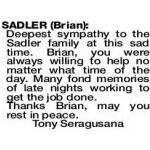 SADLER BRIAN It is with much sadness that I have learnt of Brian's passing. You provided me with the inspiration to do greater things with my life, a worker second to none and a mentor to me in so many ways. You were also the best Boss I ever had. Thanks for all your help over the years. With Sylvia again. 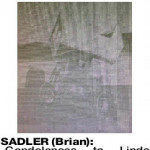 Condolences to the Sadler family at this sad time. 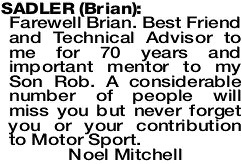 Brian was a great friend for many years. Sadly missed. Greg, Linda, Ben and Sarah Migro. 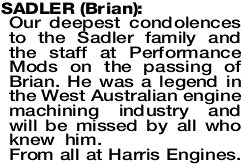 Deepest sympathy to the Sadler family and staff at Performance Mods. Management and Staff, Automatic Transmissions R Us.